When a user visits the page that contains Image Uploader, it is automatically downloaded and installed. This process is discussed below. 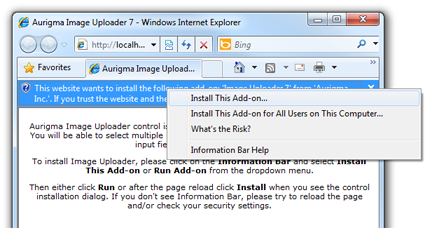 By default, Internet Explorer settings allow automatic installation of add-ons (with security dialog). However, sometimes automatic installation is disabled. Usually it happens in corporate networks if the security policy of the company does not allow it. The following two sections tells how users with such security settings can install Image Uploader. Once Image Uploader is installed, it will not be downloaded again. If you need to update it	(e.g. when deploying a new version), find instructions in the Upgrading Minor Versions topic. If users open a page with Image Uploader in one of the other supported browsers, they should make sure that Sun Java Runtime Environment (Sun JRE) 1.5 or later is installed. If so, Image Uploader will be automatically downloaded and installed. 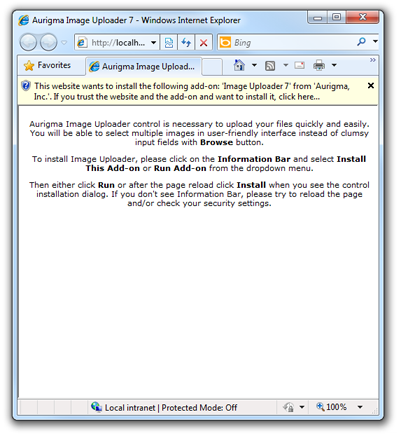 Depending on the browser settings, security dialog prompting whether a user permits installation of Image Uploader may be displayed. If Java applet caching is enabled on the client side and you use caching in the code (as done in all demo applications), once Image Uploader is loaded on this page, it is cached and will not be downloaded again. If you need to update it (e.g. when deploying a new version), find instructions in the Upgrading Minor Versions topic. 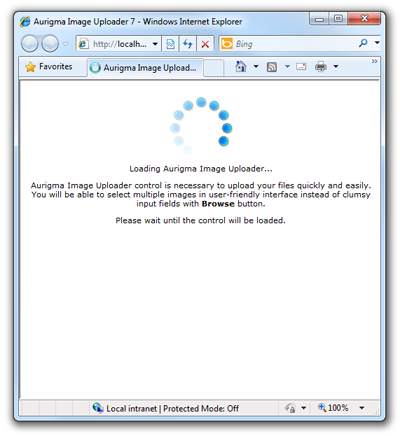 Find details about this feature in the Using Image Uploader Installation Progress topic.